Sometimes it is hard to explain your predicament to other people when you are not sure what they are going to say to you or how they are going to react. I am tired of babbling. I no longer want to explain further. Sometimes it gets tedious to get to know new people especially when I know that they will never get along well with me. This is why I keep myself civil in front of people that I don't feel opening up to. Even if I know that some of them have bad attitudes, personalities or even histories, I no longer want to get involved. I no longer want to know. I have learned in life that sometimes it is better to just become apathetic for only those who truly care will exert effort to get to know you better and to open up to you and vice versa. The world is filled with people who are hard to trust. I am a nice person. Everybody tells me that but I have learned to know my limits. I have realized that nice people are almost always taken advantage of. I am done being that doormat to some people who either want to do such a thing on purpose or those who accidentally do it. I have vowed never to be one again and I never want to put such a fate upon others. Sometimes it is best to just keep things quiet. I am way past my chatty self. I no longer am the young happy go lucky young woman who I used to be. I wish I was but then again, reality has hardened me. For every dent it has given to me, to every blow, I remain here. Although I have been bruised and sometimes badly wounded to the point that I feel like I will never be repaired once more, I rose to the occasion. I am done being perceived as something that I am not. I am done doing things for others who do not appreciate me. Most of all, I am tired of trying to get to know people better when I know that nothing will come out of it. Sure, these ideas sound like I am turning into an anti-social person but then again, I do not think so. What is wrong with staying true to the fact that we should choose our friends? I am older now and somehow wiser but somehow I am still naïve to things out there in this world. Things that might hurt me or cause harm to those around me. I do not want to risk that. I should be more cautious now. Is there anything wrong with that? I know I can never give good enough reasons to immediately shut down in front of a group of people. I am not like that. I like to observe first and assess the situation. If I know that there might be some things that I should do to make things work with new people to become friends with them then so be it. But if I keep on trying and see that nothing good will result from my efforts then what for? I would rather not waste my time on such things. Call it the love me or hate me, I don’t care attitude if you will. But I don’t want to turn a blind eye, play deaf or be mute to many things. I am still human after all so the point of socializing is still valid. This is why even to this day, I am socializing. There is a need for it. It is my nature. But I have learned to limit myself through the years and somehow I have no regrets. I cherish my friends, my real friends. Those who really care about me and really want to be my friend will always make me complete. Who needs more people who will only give you stress when you can have people who won’t? Think about it. 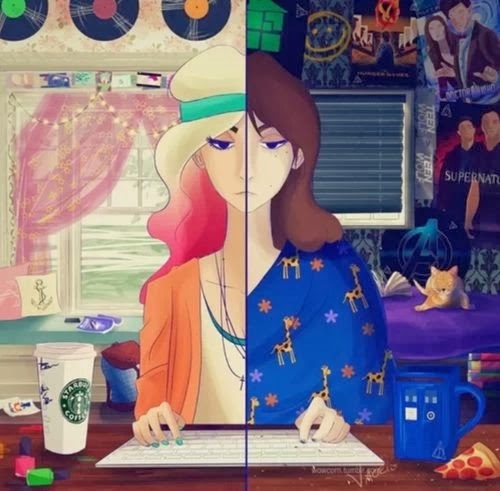 It is hard to live a double sided life. Just because I cannot or will not conform with the norms does not mean that I am different in a bad way. What if I am just different because I want to? So, what if I am misunderstood? 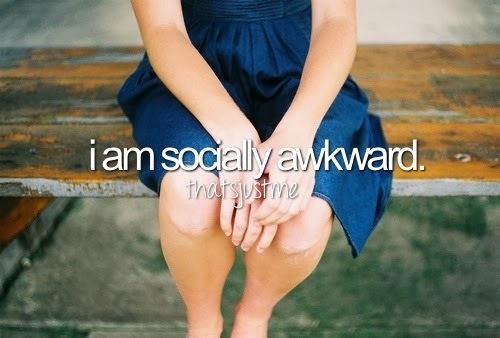 I am socially awkward. Live with it! In the end, maybe one of the biggest reasons as to why I don't interact much is the fact that I no longer want to be involved in drama and unnecessary things. I also am allergic to idiotic and most of all fake people. I have learned my lesson. 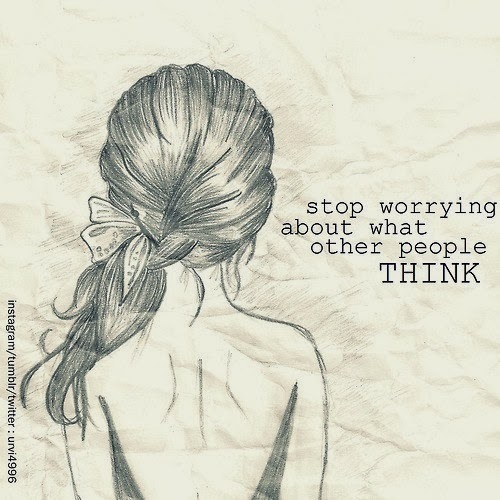 I wish other people will too. But don't judge me. 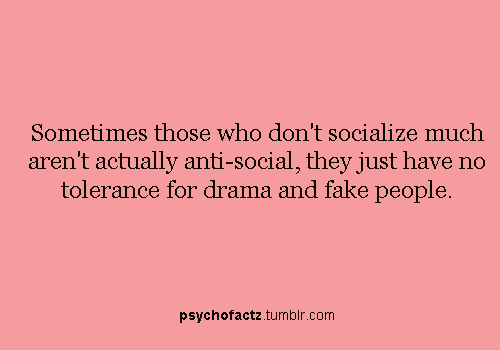 I am not anti-social. I just feel like being indifferent to things that I should be indifferent to. Sometimes shutting down is better than being a sponge. I don't want to absorb everything. I want to use a filter this time.